God continues implementing His plan for His chosen people, and the whole world, which He started in Genesis. 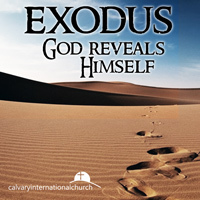 Pastor Nathanael Fawcett looks at the book of Exodus in light of how God reveals Himself to us. Where does obedience to God begin? In the list of commands and rules given to the Israelites, how does this playout for us today? What is the foundational reason behind the commands that God is trying to communicate? Continuing in Exodus 20, Pr. Nathanael Fawcett brings us around to evaluate God´s character and how He wants us to live. To us humans, sometimes the character of God, some of His attributes, seems to be full of paradoxes. For example: love and wrath, justice and mercy, truth and grace. But only in God alone are these in perfect balance. Our human tendency is to over emphasize one over the other. As Pr. Nathanael continues to look at the book of Exodus, we need to evaluate both sides of each equation in order to truly understand God and how He wants us to live so that we do not live in either extreme.